After church a couple weeks ago I was asked a question; “is there anywhere in the Bible where we are told to ask God for forgiveness?” Now I had already recognized this issue as one that has permeated Christendom, but after being asked this question I thought I should address it on the blog. 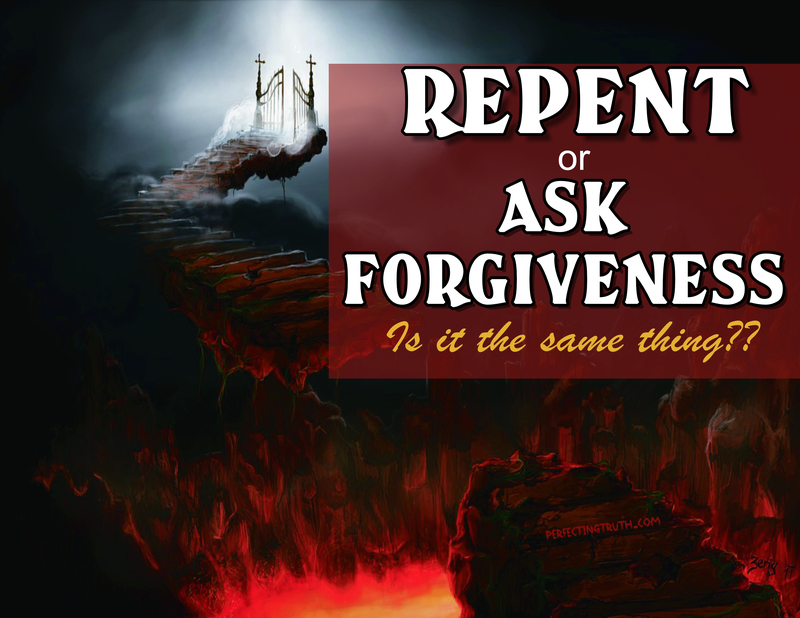 So, repent or ask forgiveness? Is it the same thing? Does God require a request for forgiveness or does he require repentance? I submit another question. If it is repentance, then when was the church ever given the authority to replace repentance with requesting forgiveness? Something to think about isn’t it? Let’s dig in. The Hebrew word for repent is שׁוּב [shûb (prounounced shoob)]; it means to turn away. The Greek word for repent is μετανοέω [metanoeō (pronounced met-an-o-eh’-o)]. It means to think differently, to reconsider (morally to feel compunction). The word translated repentance in the New Testament is the Greek word μετάνοια [Metanoia (pronounced met-an’-oy-ah)]. It means compunction for guilt. We do not pardon ourselves, God pardons or forgives us. By God’s law there is no remission without the shedding of blood; therefore, without repentance (compunction for our sins committed against God) and believing that Jesus Christ is God’s only begotten Son who came to redeem us through his death on the cross AND resurrection we will not receive remission of our sins. Repentance is much deeper than a superficial “I’m sorry” or spur of the moment “forgive me.” It does not matter how many times we say “forgive me Lord,” without true repentance, a change of heart/a true turning away from sin, we are just beating our gums. Repent and believe is the order God has set. When we reduced this to a simple act of “just ask God into your heart” or “just ask God to forgive you” without stressing the importance and requirement of heartfelt repentance (compunction for sins committed against God) we have sinners walk away from church altars unchanged. We send them away from baptismals as wet sinners. Worse yet, we erase the need to repent and truly believe in Christ’s work, thus sending them away “thinking” themselves right with God because the preacher said so…when in actuality the Lord still awaits their repentance with a heart truly turned devotedly to Him. A testimony or a sermon may scare you, but did it scare you to repentance? You heard a word and were made sorry, but are you sorry to repentance? You may even have been moved to tears, but are you moved to repentance? We can be sorry for a lot of things, sorry we got caught etc… but God requires us to repent, to turn away from our wicked ways. A heavy price was paid for us to receive God’s remission (forgiveness) of our sins. Do you believe it? Repent and believe is the message the church has for unbelievers. Repent and believe. If we water it down, take the meat out of it, etc… then woe unto us, because that is not what the Lord told us to do. God did not tell us to merely ask him for forgiveness. He tells us to repent, and repent we must. He tells us to believe in Jesus’ Christ His Son, who died for our sins and was raised from the dead, and believe we must. Juanita, God has been putting this same thought in my heart lately. Thank you for using scripture to make this important distinction. The heart posture of repentance goes so much deeper than saying I’m sorry. God bless you! Powerful word! Thank you for taking time to read and comment on the post. I think the removal of repentance is major, and many don’t realize it–hence the Ravenhill quote. Many have fallen for the Okeedoke because the removal of repentance has been subtle and a most clever trick of the Enemy. A most clever trick indeed. Thank you for your deep thinking and discerning spirit. Your fervor for Christ is an inspiration! A clever trick indeed. Thank you for your discerning spirit and diligence in thinking deeply about God’s Word and our response to His holiness and grace. You are an inspiration! Thank you for your kind words of encouragement. God bless you! So repentance is a step further than asking forgiveness. I never thought of it that way! Oh yes, repentance is deeper than our normal view of asking forgiveness. Thanks for reading and sharing your thoughts! 🙂 Thanks for reading and commenting!